“Fire Opal’s energy opens the channels to creativity, passion, confidence, and sensuality. This is the time to connect with pleasure by blending more love into your experience. Let go of any shyness, fear, or shame holding you back. Allow yourself greater enjoyment by releasing self conscious feelings. This gem resonates with your sacral chakra, which relates to physical desires. This card encourages you to do things that help you to feel sensual. Listen to music, light candles, burn incense, wear red, or decorate your bedroom – anything that sets the mood. Your self confidence will grow when you allow your sensuality to be unleashed. Whenever the element of fire is present, transmutation and alchemy are possible. Stagnancy can be transformed into passion; fear and doubt can be changed into confidence and joy. If we allow this to be possible for us. Fire Opal is a precious and powerful stone. It is a perfect stone for a focused, eyes open, gazing meditation; for it is constantly shifting and changing. The fires are literally burning within it and they radiate out for us to admire and learn from. Yes, it catches the light, but there is an aspect to its flash that appears to be a pulsing of power, a show of sorts, a playful display of what is possible. 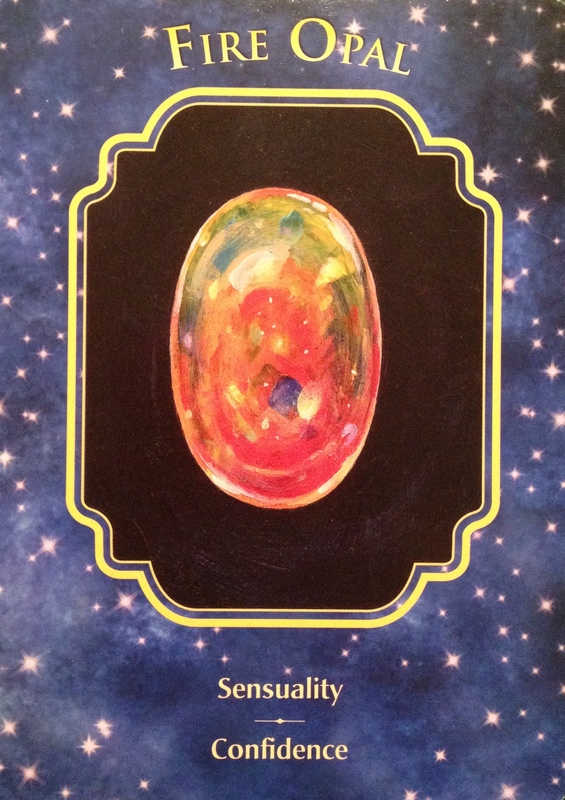 Fire Opal asks you to dig way down deep and release your light. This is where your true gifts lie. Right in the center of your Heart center, where your Soul resides. There is so much light there; so much love. And it’s time to let it out in flashes of fire and passion in your life right now. This is the power to heal, to inspire, to ascend. To awaken. Yourself and those around you. Through releasing your beautiful, magical light. Wear warm colours; particularly orange to connect with your fire and balance your sacral chakra. Try Kundalini yoga! Move your body to sensual music. Light an orange, red or yellow candle. Paint your toe nails or your finger nails a warm, firey colour. Take it a step farther and put some red in your hair! But most importantly, find your passion. Get out of your comfort zone and have some fun. Get inspired. Do something artistic that brings you joy.